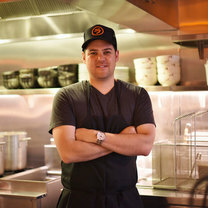 Kyle Itani is the chef/co-owner of Hopscotch and Itani Ramen. 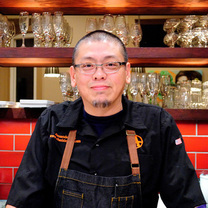 He credits his Japanese-American heritage for instilling in him a passion for fresh ingredients and diverse cooking techniques at an early age. 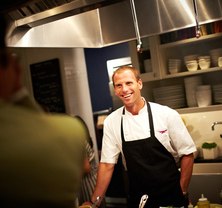 He has honed his culinary skills on both the West and East coasts including Yoshi's in San Francisco and Oakland and New York City's Meatball Shop as well as a stage tour in Japan. Don’t Turn the Dining Room Into a Photo Shoot | Chef Kyle Itani | WTF Are You Doing?! Taking a picture doesn't make it last longer, it makes it go cold faster. Kyle Itani's cool with sly tableside snaps—but quit fussing over it! OY. WTF Are You Doing?! gives chefs the chance to gleefully reenact the awful behavior they see in their dining rooms everyday. "The fruit de mar platter at The NoMad Hotel. My pre game meal for the Warriors game 4." "Birria Sopes at Frontera in Chicago. Best dish of the trip...and I've eaten a lot!" "A humble plate of sausages and sauerkraut but oh so good. I love this place, especially for large parties. Their back room is perfect for any size. Get these sausages with a kostritzer on draft. You won't be disappointed." "I enjoy eating sopes but have never had them served in broth. They braise the whole goat and make a consommé with the braising liquid. That liquid is blitzed with arbol chiles and served under the sopes, piled with shredded goat. Truly incredible"
"So much flavor in the broth and the mussels were the perfect conduit to deliver it." "Three steps of the Oysters Hop-a-Feller. Mookie Blue Oysters from @#lovemeagoodpun"
"Spring has sprung @itaniramen Braised lotus root, spinach ohitashi, tofu-walnut Aspara-Shirae, miso dip crudités. #oakland"
"The scallops are grilled to perfection and drizzled with fresh squeezed lemon, making them a great dish for dinner." "Amazing crust, moist chicken, well seasoned and served with creamy polenta." "Perfectly seared scallops with a creamy, salty and crispy brandade. Simple, balanced and delicious."